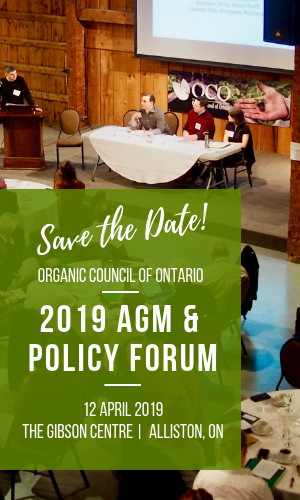 The Organic Council of Ontario introduced the Ontario Organic Awards to celebrate excellence and innovation across the full organic value-chain. Award recipients demonstrate consistent and pioneering efforts that help the organic sector reduce the amount of toxic pesticides in the environment. Members of OCO, farmers, businesses and volunteers have made tremendous efforts to ensure that organic practices are recognized as trustworthy in the marketplace. The 4th Annual Ontario Organic Awards were held on February 1st, 2014 at the River Run Centre in Guelph. We had a great night of celebrating the amazing dedication of so many Ontario organic farmers, businesses and individuals. Please join us in congratulating the award recipients! The work of Garry Lean, a notable organic sector pioneer, was celebrated with a Lifetime Achievement award. Garry has been a key figure as an instructor of organic methods, an inspector for organics, and has contributed to the development and implementation of essential instructional materials for inspectors and organic growers. Beginning in 1976 Garry Lean taught at Fleming College where he developed a two year program in Agroecology and Organic agriculture. Garry’s first organic inspections began in 1987 and have continued for 27 years with over 2500 site visits involving crops, livestock, and processing. Since 2003, Garry has been strongly involved with IOIA – the International Organic Inspectors Association – first as a member, then Chair of the Board of Directors and currently as a lead trainer for the Basic Inspector Training Courses in Crop, Livestock and Processing. Garry’s commitment to organic has been lengthy and steadfast and for that commitment he will be honored with the Lifetime Achievement Award from OCO. Organic production is the most scrutinized food sector in Canada, which is the result of the tireless commitment of individuals, farmers, and organizations. These quiet heroes of our food system will receive recognition from their peers for caring deeply about how food gets onto Ontario tables, and how our food system can positively impact our economy, health, and ecosystems. OCO is delighted to highlight organic pioneers as well as new organic businesses who work diligently to ensure a transparent and accountable food system. We are here to celebrate the hard work and commitment of these humble individuals.